Pepsimojified pictures are tweeted to Participants. Pepsi used Tiger Party's Moderation Tool to approve incoming tweets. Approved tweets are queued up to go on Times Square billboards. Each Pepsimoji is blasted across the three Times Square billboards: Disney, Express, and American Eagle. Pepsi launched its GET INTO PEPSIMOJI campaign on June 6, 2016 to create brand awareness among New Yorkers and tourists. During the campaign everyone was able to line up to play with Pepsimoji app facilitated by brand ambassadors in Times Square. Each participant got their very own Pepsimoji (an emoji customized by Pepsi) , which was not only shared on Twitter, but blasted across three Times Square billboards: Disney, Express, and American Eagle. Participants were encouraged to select a Pepsimoji and pose for the camera which let them become their very own Pepsimoji. Brand ambassadors on the ground collected participants’ Twitter handles so their Pepsimojified pictures were tweeted to them from Pepsi, and they were able to retweet and share as they please. Besides that, participants were able to mention their friend on a tweet and be seen on Billboards as well. These photos were also the content that was beamed across 3 larger than life Times Square Billboards. This process gave people an incentive to participate, created an interactive experience between billboards and participants, and ultimately drove awareness of the Pepsimoji program. Tiger Party utilized our customizable Moderation Tool to allow Pepsi to moderate incoming tweets and make it ready for public display. Participants could tweet about the event, post pictures of themselves, and mention their friends in tweets. If the content was approved by moderators, users would see their photos and tweets on many of the signs throughout Times Square. 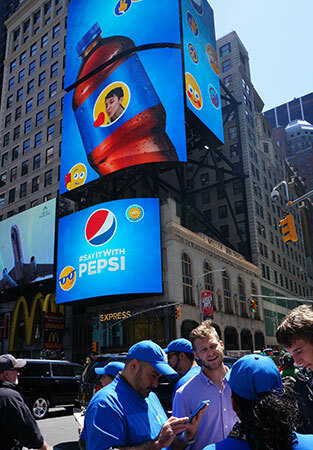 GET INTO PEPSIMOJI event not only raise Pepsi brand awareness among New Yorkers and tourists. This event made a lot of people feel “famous” by showing them on Times Square billboards.